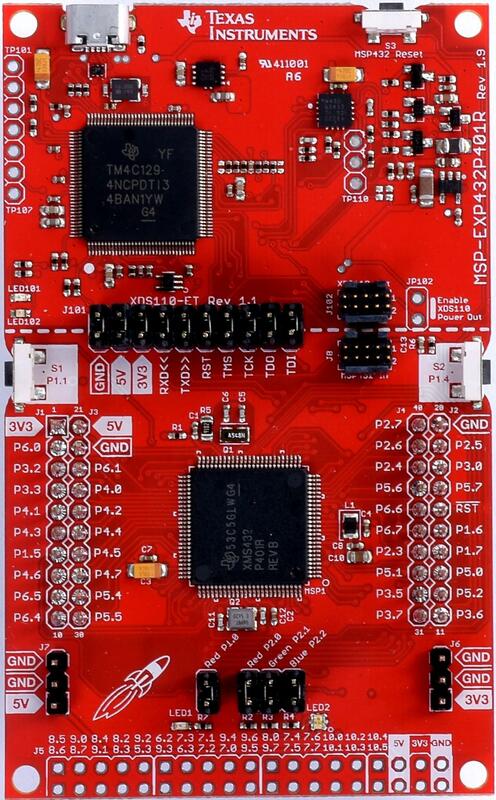 The SimpleLink MSP‐EXP432P401R LaunchPad development kit is an easy-to-use evaluation module for the SimpleLink MSP432P401R microcontroller. It contains everything needed to start developing on the SimpleLink MSP432 low-power + performance ARM® 32-bit Cortex®-M4F microcontroller (MCU). Details on the MSP-EXP432P401R LaunchXL development board can be found in the MSP-EXP432P401R LaunchXL User’s Guide. The on-board 32-kHz crystal allows for lower LPM3 sleep currents and a higher-precision clock source than the default internal 32-kHz REFOCLK. Therefore, the presence of the crystal allows the full range of low- power modes to be used. The on-board 48-MHz crystal allows the device to run at its maximum operating speed for MCLK and HSMCLK. More details about the supported peripherals are available in MSP432P4XX TRM Other hardware features are not currently supported by the Zephyr kernel. Follow the Getting Started Guide instructions for Zephyr application development. The resulting zephyr.elf binary in the build directory can be flashed onto MSP-EXP432P401R LaunchXL using the command line utility mentioned below. UniFlash command line utility is used to program the flash memory. Only elf loading is currently supported. The ccxml configuration file is included in boards/arm/msp_exp432p401r_launchxl/support. MSP-EXP432P401R LaunchXL board supports debugging primarily using CCS IDE. More information on debugging using CCS can be found in CCS Debug Handbook. Launchpad also supports debugging using GDB. See section 3.3 of GCC ARM Toolchain Guide.